Heather Marrow of Studio DTQ is a Connecticut based Etsy artist with style. Her unique and charming combinations of wire and Swarovski Crystal are a joy to look at. Heather's jewelry has distinctive charactor. She uses todays treasures to create an heirloom quality collection that anyone would be proud to wear. I am particularly drawn to Heather's work in copper and crystal. The rich mixture of gleaming metal and sparkling crystal is pure luxury and yet somehow mysterious. Do yourself a favor and peruse Heathers etsy store and while there be sure to notice her lovely packaging. It is another indication of her artistic flair. 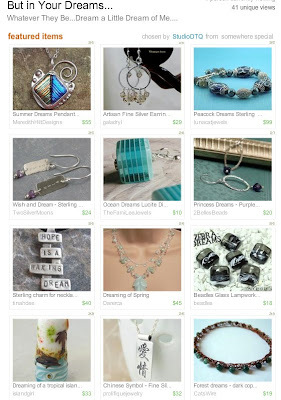 Heather was kind enough to feature Bonnie's aqua dice earrings in her Etsy Treasury titled But in Your Dreams. Thank you Heather. The FamiLee jewels appreciate your support.